Elmo is the first one up and he greets the stuffed bear with some idle chatter. 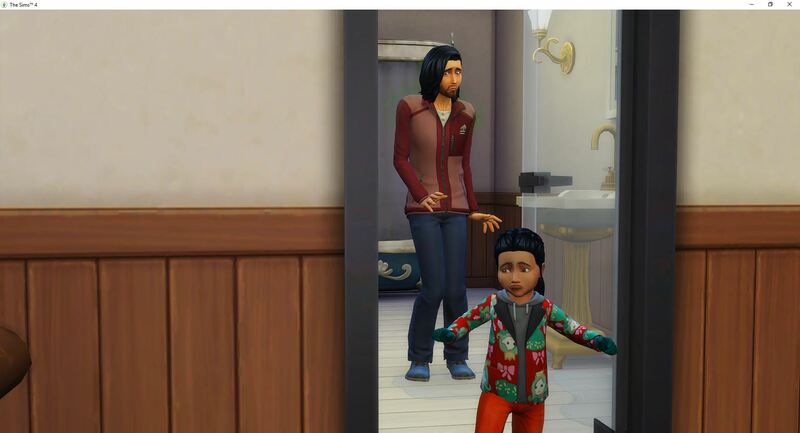 Then the rest of the household comes to life. 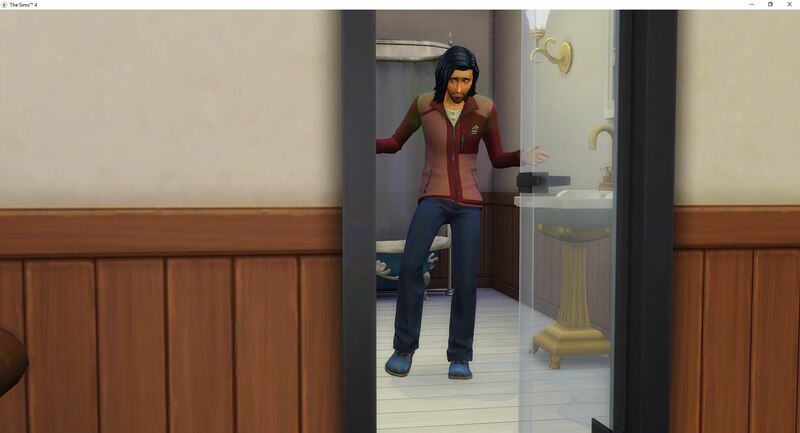 Jade tried for several hours to repair the sink but she kept getting shooed out of the bathroom. 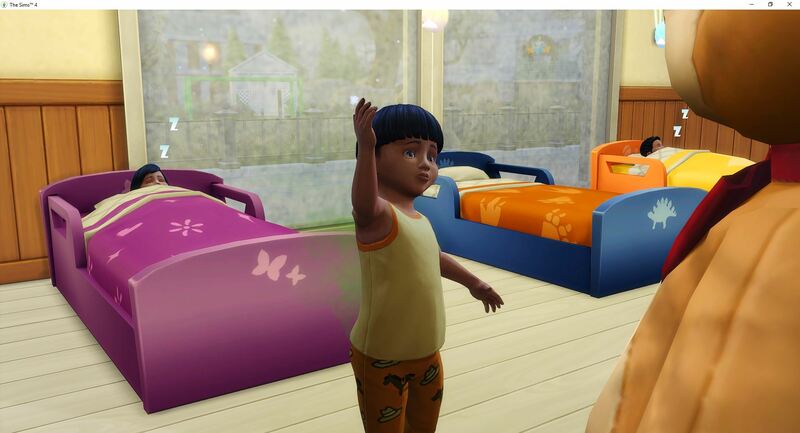 Finally, they built a second bathroom and bumped out the walls of the master bedroom and the children’s bedroom just a little bit for an illusion of more room. 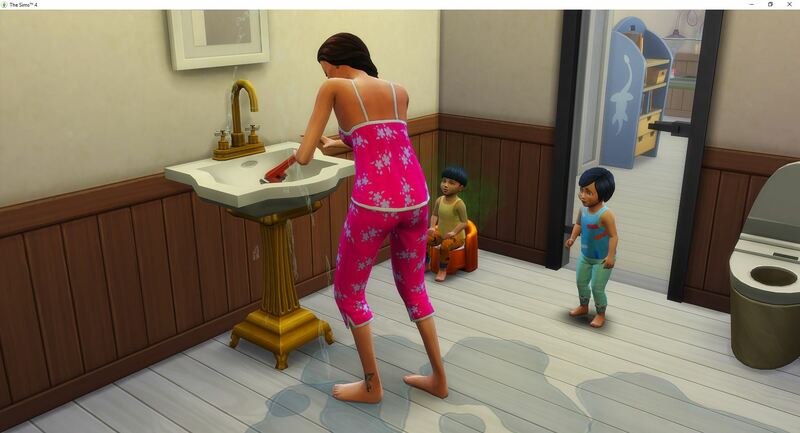 Once everyone had peed and showered, Jade was able to repair the sink. 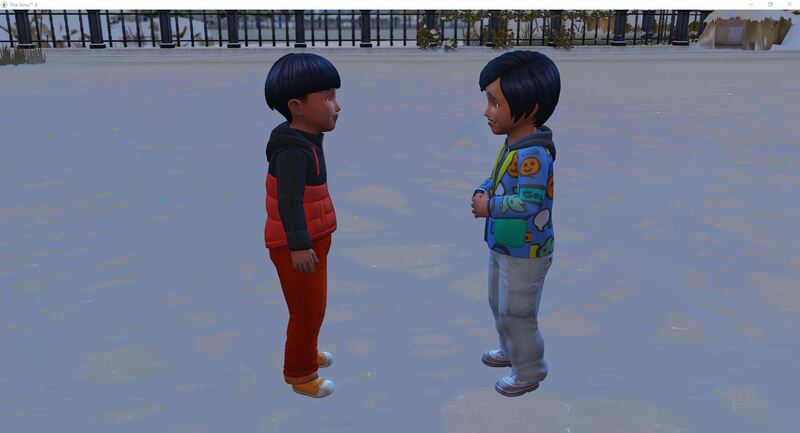 Elmo is working on mastering the potty and Itsuo is “watching”. 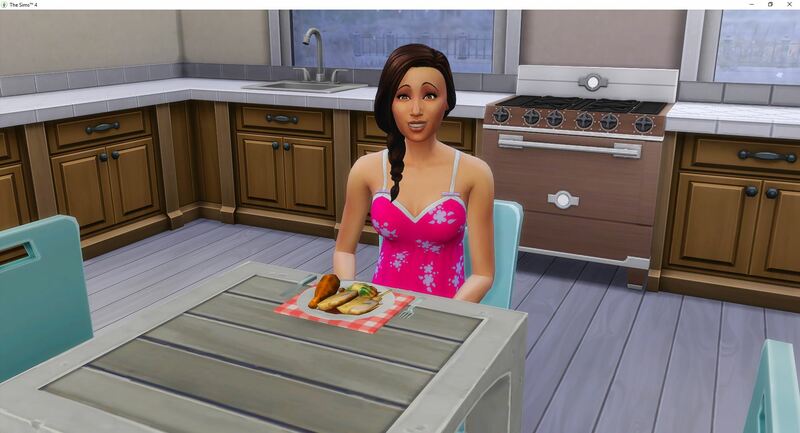 “Alyxus” keeps forgetting that she is a vegetarian and she keeps “choosing” non-vegetarian meals. If she is going to be vegetarian, she should be making better choices on what to eat. 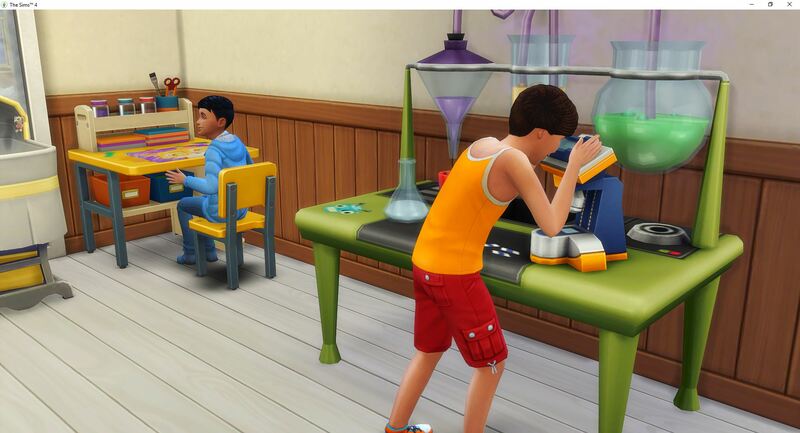 While they wait for school to start, Dusty is still working on that arts badge and now Ruthy is working on the science badge. 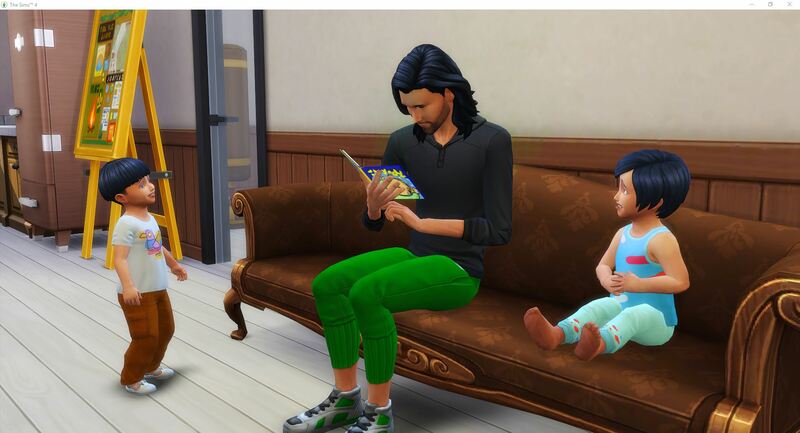 Elmo is still hogging the potty so Jade is reading to Itsuo. Itsuo doesn’t want a second story – there are just too many pages, too many stories. 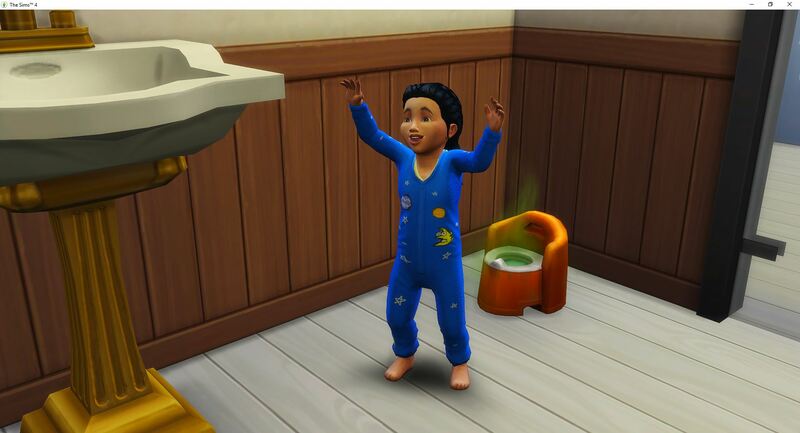 But he still needs imagination and the potty is still occupied. 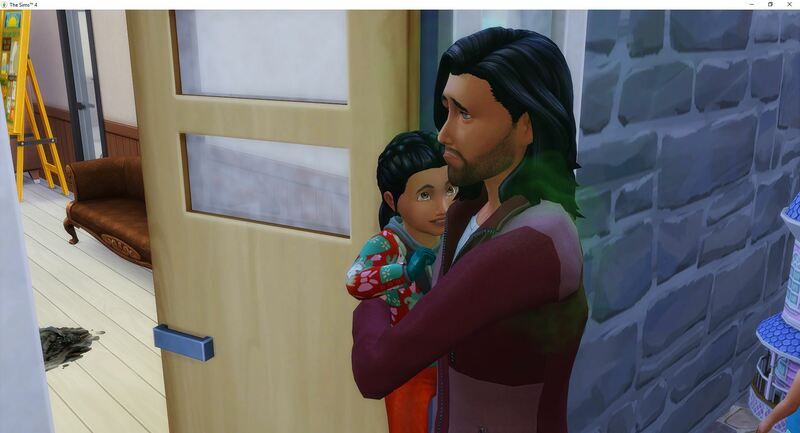 He is going to get another story before Jade leaves for work. Then he is going to start his potty mastering when Elmo is finished. 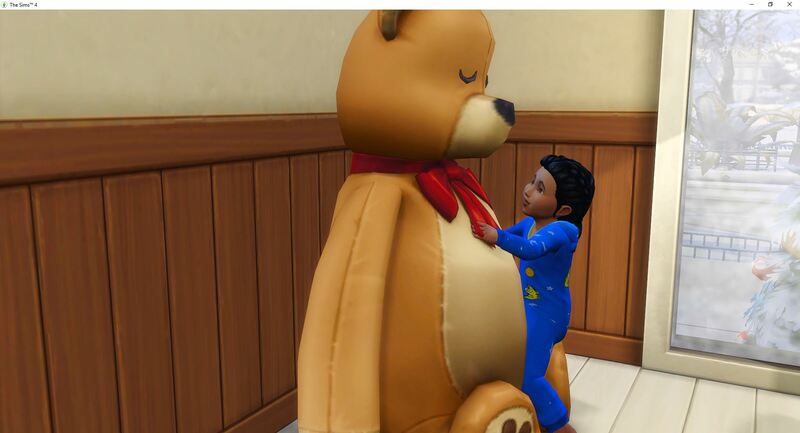 Ngoc has finally woken up and since there isn’t anyone available to start her potty training – and there is still only one potty chair which Itsuo is currently controlling, she will be sent to the teddy bear to work on communication. Darien and Elmo both need a bath, but Elmo goes first. 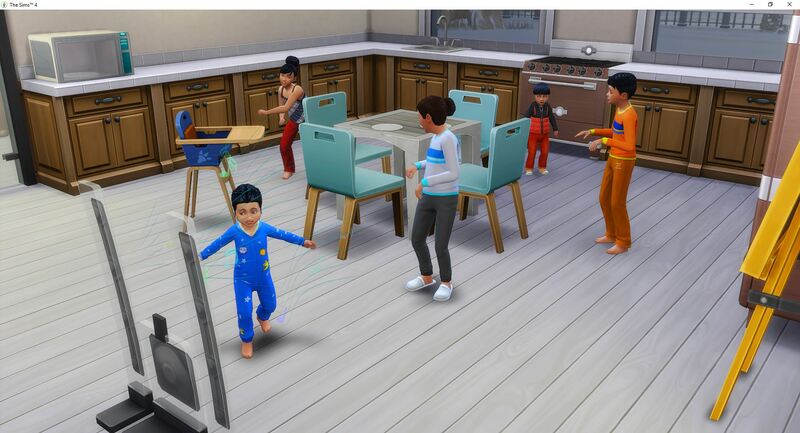 Then Darien will grab a quick shower and he will probably get back on the treadmill to work on his career and aspiration goals since the toddlers can work on their skills alone. 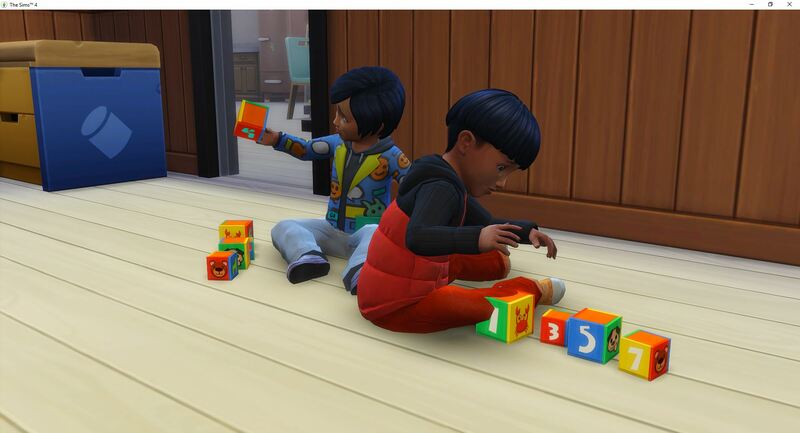 Except for Ngoc’s potty training, but that can wait for the moment since she has other skills to learn and Itsuo is still using the potty. 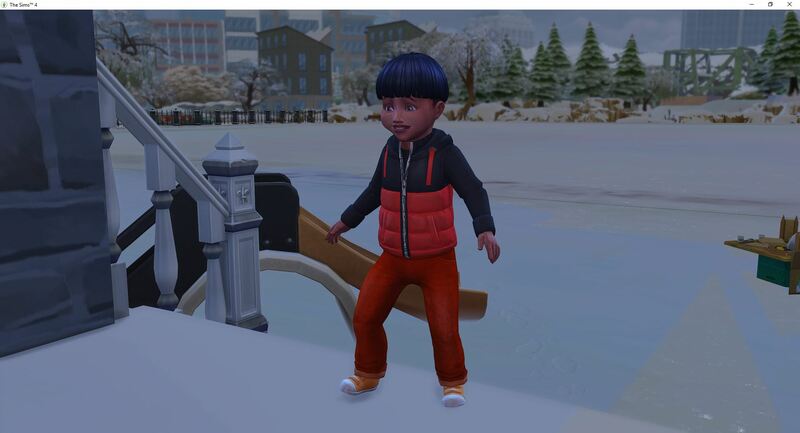 Ngoc quickly masters communication and is sent out into the cold and snow to begin working on movement. No rest for the weary in this household. 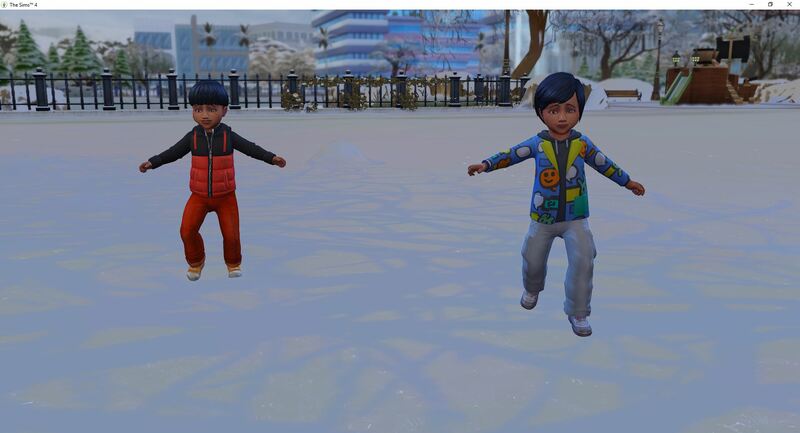 Darien doesn’t get to take his shower or work on his fitness – the kids come first. 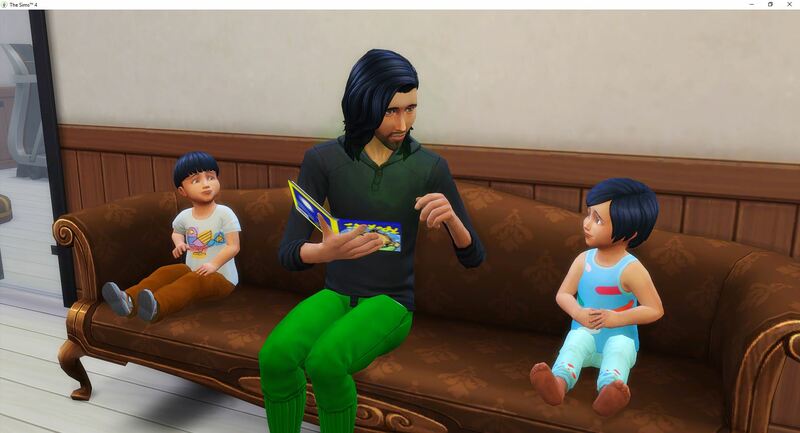 He moves straight into reading stories to Elmo while in the background Itsuo is still working the potty. 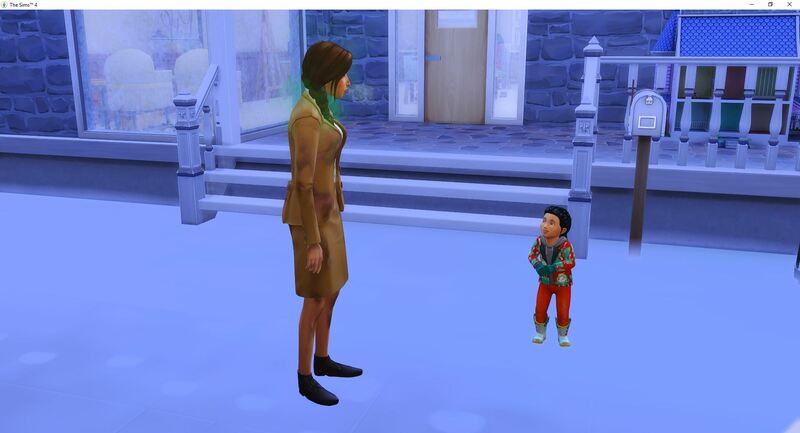 As soon as Itsuo has mastered the potty (finally), he comes out and listens to the stories that Darien is telling. This is literally their entire day. 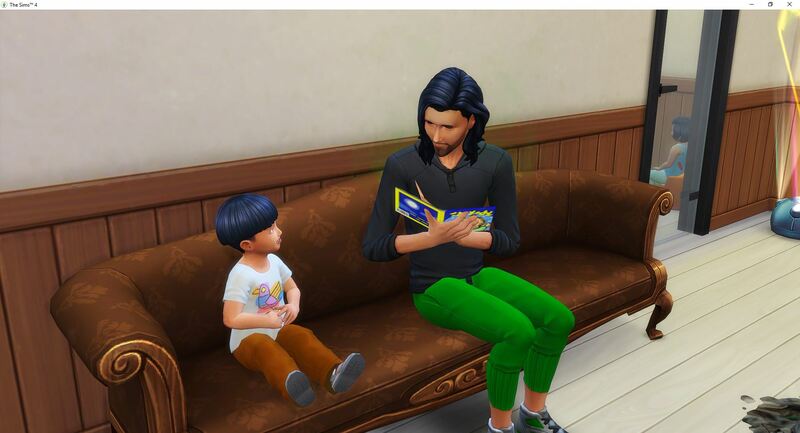 When Elmo masters imagination, he switches over to watching Darien read stories to Itsuo while Itsuo listens to the stories being read. 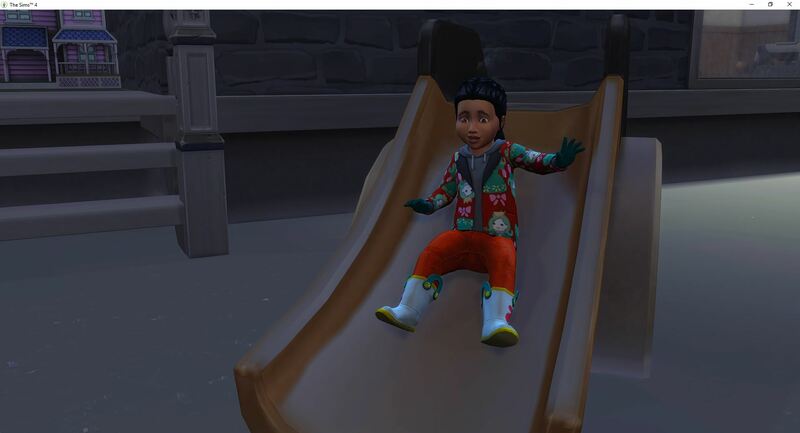 Outside, Ngoc is still slip sliding her way – currently level 3. 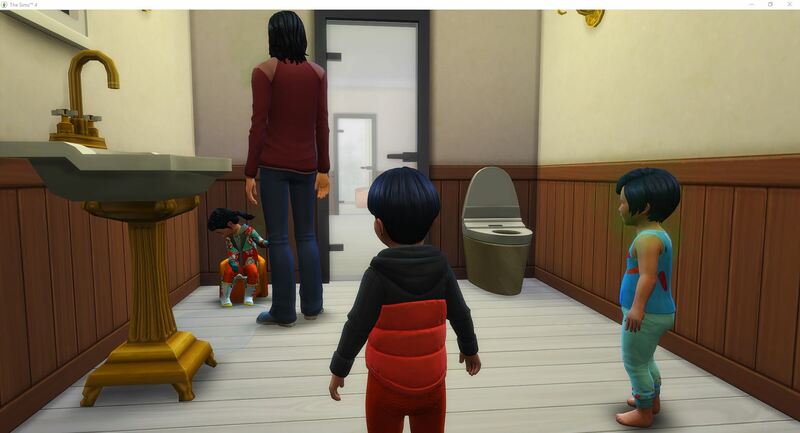 Taking a quick break, Darien decides to try to get Ngoc onto the potty. She is about to use her diaper again and it already needs to be changed – but this would be an excellent time to start her potty training. But the race is on because there is no time to spare. Her red can’t get any redder. Nope they didn’t make it. 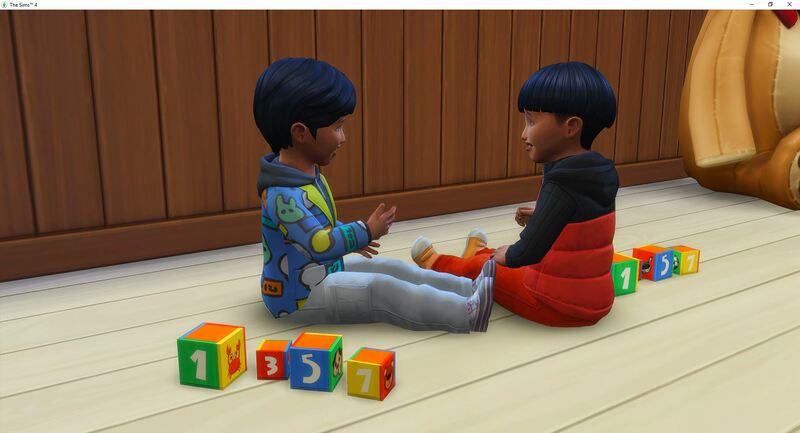 Ngoc is using her diaper as Darien holds her – she couldn’t hold it any longer. 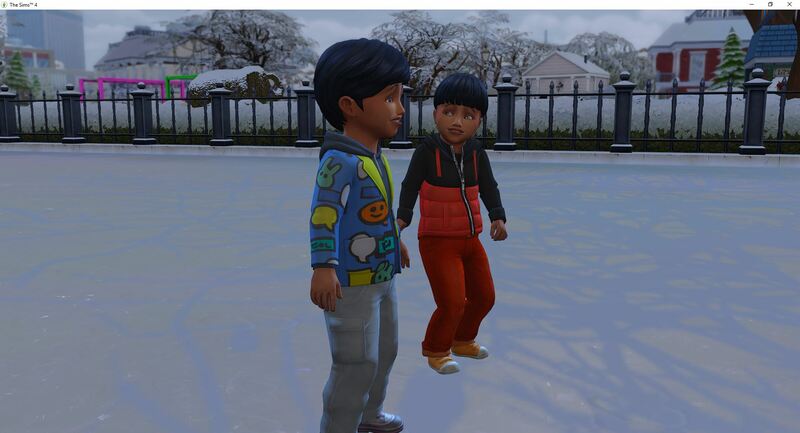 While Darien is potty training Ngoc, Itsuo and Elmo are watching Darien. Itsuo is exuding a potent green cloud again. The boys peel off and head for food leaving Darien to finish up with Ngoc. 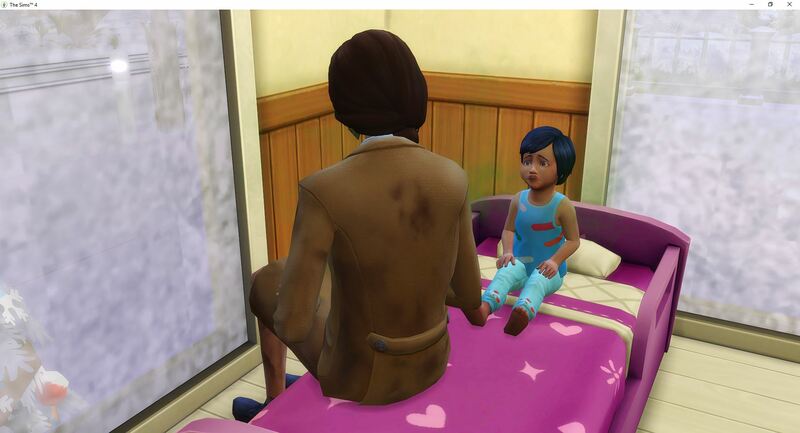 She learns a lot while sitting on the potty but not enough to go by herself yet. But she can’t sit for another session yet. 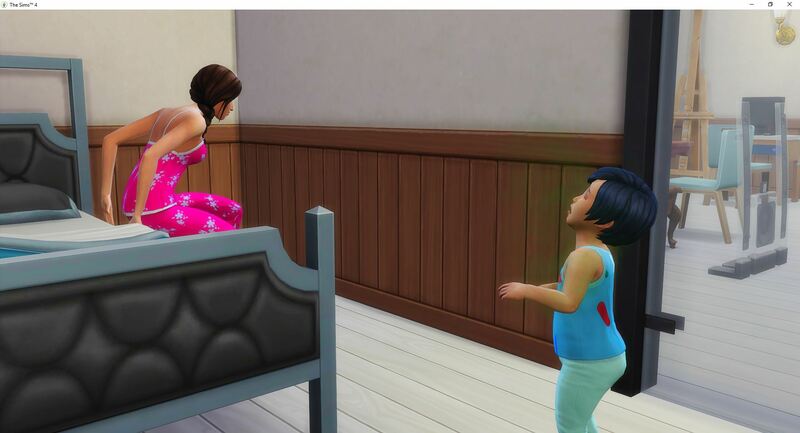 After she gets up she asks Darien to change her diaper and then she follows the boys to the food. Darien realizes that maybe, just maybe, he waited too long to take care of his own potty needs. Yeah, well he already needed a shower. He finally gets in the shower and cleans himself up. What he doesn’t do is clean the pee off the floor – his or the toddlers. Jade comes home, once again looking like she has been rolling around in the mud. Ngoc needs one more session on the potty before she can go by herself. 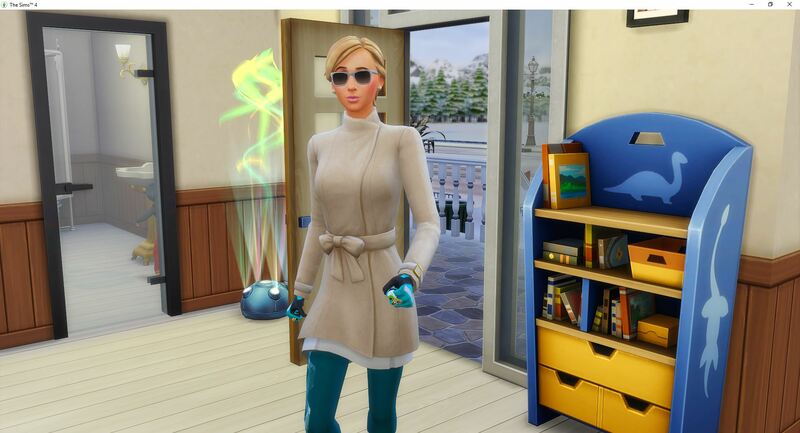 So, she heads outside to ask Jade to help her out. Because, Jade doesn’t need any time to change, or shower, or eat, or pee. Dusty, Dude. Really?!? 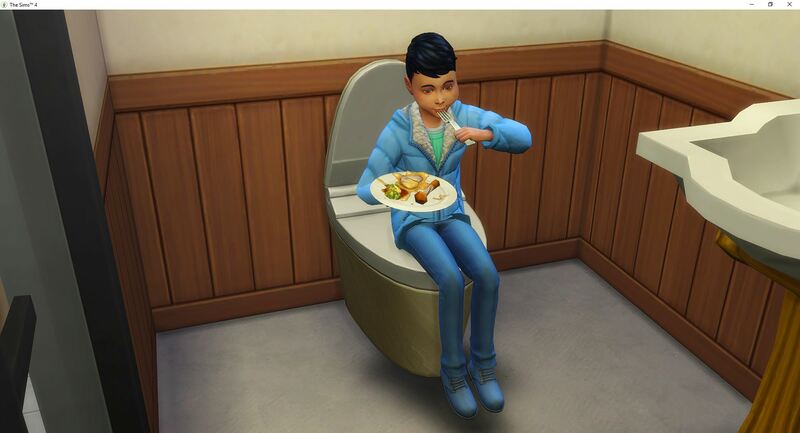 For the record – he is peeing and eating. Maybe he is pooping, but I really don’t want to go there, well already did. Sorry. After taking Ngoc to the potty, and getting kicked out of the bathroom (again) by Ruthy, Jade takes Itsuo to bed. Itsuo needs a bath as bad as Jade, but he isn’t getting it tonight. 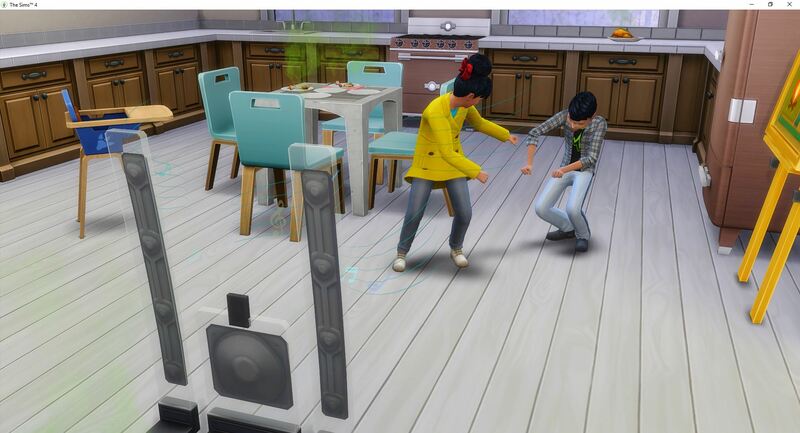 Dusty and Alyxus are down to just the fitness badge so they are dancing until bedtime. 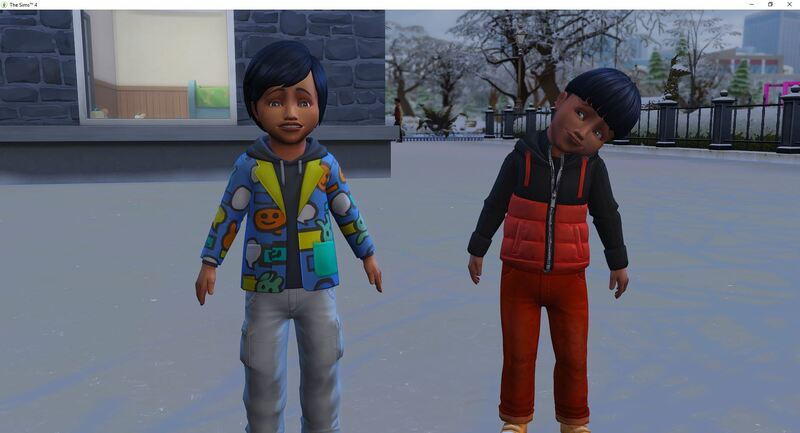 They have already done their homework – Dusty has an A, Alyxus and Ruthy both have a B. They are really liking this new invention called the stereo. The last one to bed is Ngoc. As Darien was headed out to put her to bed, she mastered movement. Nice job. She is actually my favorite, if only this wasn’t a patriarchy. Itsuo really wants a bath and wakes around midnight needing to potty. 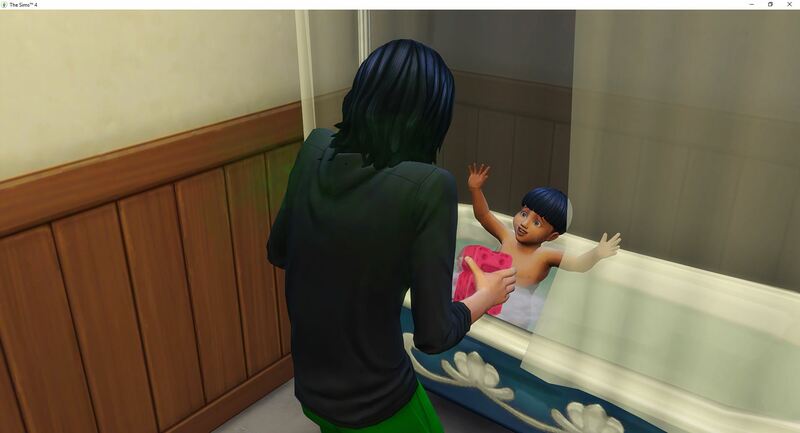 Once he is up, he gets Jade up so that he can ask for a bath. Might as well get something productive done. Who needs sleep anyways. 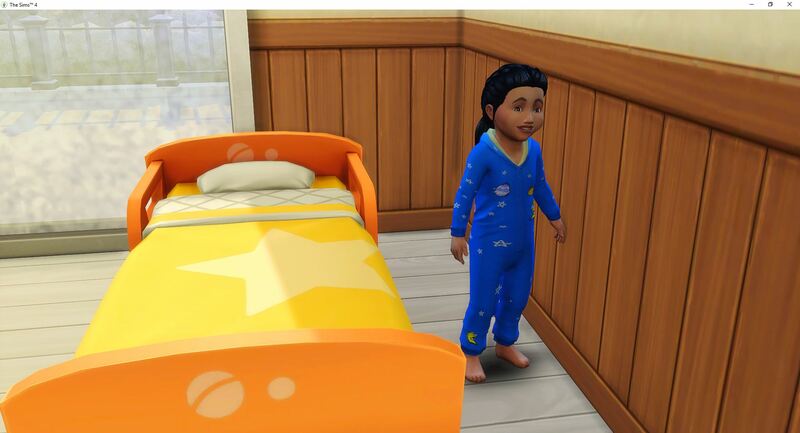 Jade has had enough sleep that she agrees to give him a bath a 1 am, and then she puts him back to bed. When the real morning rolls around (real morning=daylight), everyone is up and starting off the day with a good breakfast. 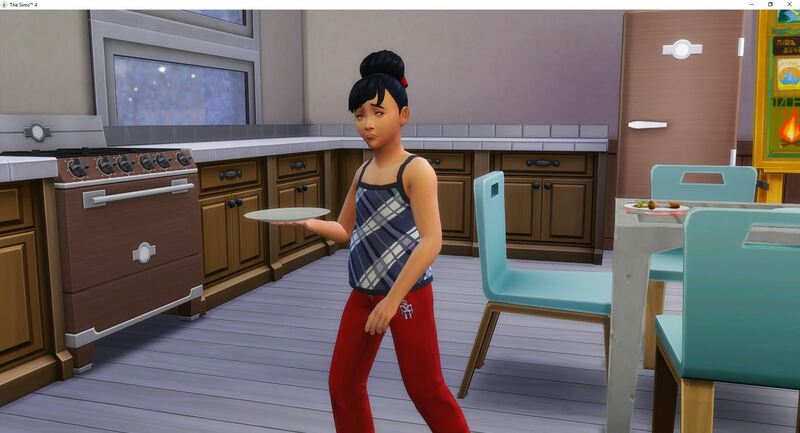 Jade stayed up after putting Itsuo back to bed and made breakfast so that everyone would have something to eat. She is better than me, because I would have not. 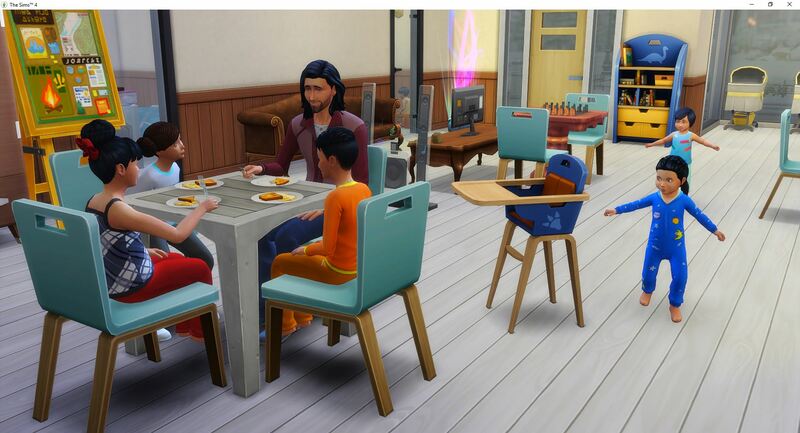 This is a first for the family, and they need a larger dining table. 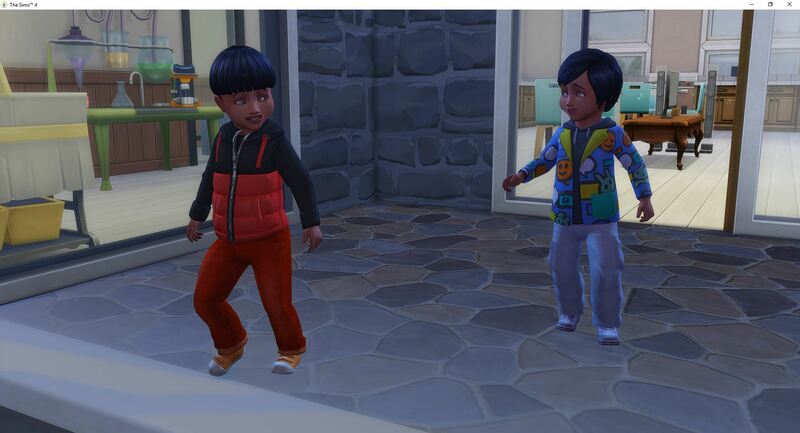 The kids have another dance party before school while the toddlers scatter to their assigned tasks for the day. The children are actually working on the fitness badge. That is all Dusty and Alyxus have remaining while Ruthy is down to four. If I were better organized, the kids would be completing their aspirations instead, but I’m not. Instead, the scouting counts as a career so when they get an A in high school, plus complete all their badges, they will be eligible to age up early and move out, if I choose. Except for the heir. That is called freedom. 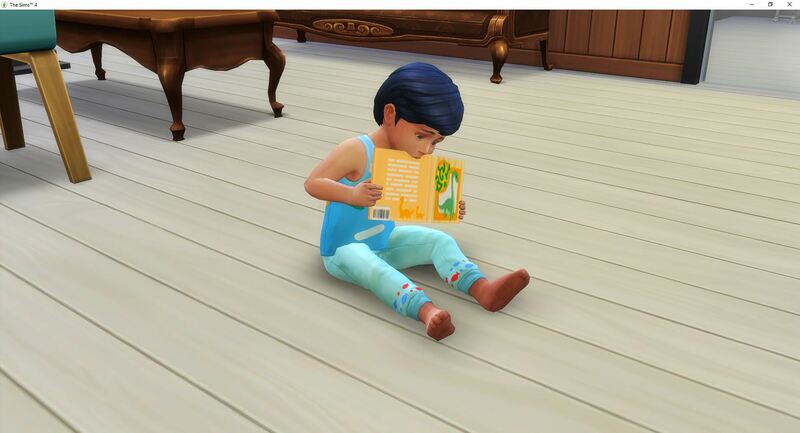 Itsuo has just a little imagination left to master, so he chews on a book until he has that done. Elmo followed her out and now is following her back into the house. 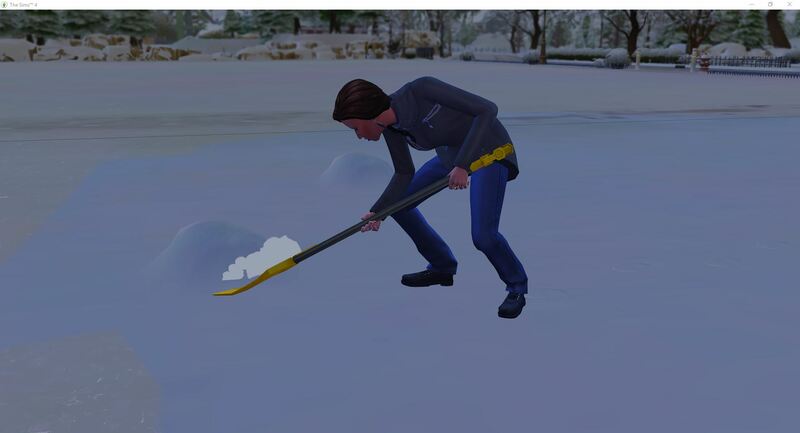 As he gets into the house, she has gone back out to shovel more snow. 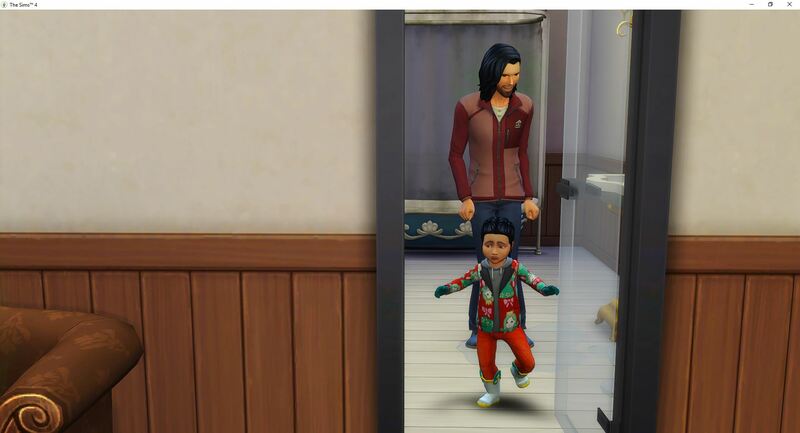 This time as he leaves, Itsuo joins him following her outside. By the time they get to where she was, she is gone again. Dudes, whatcha going to do now? 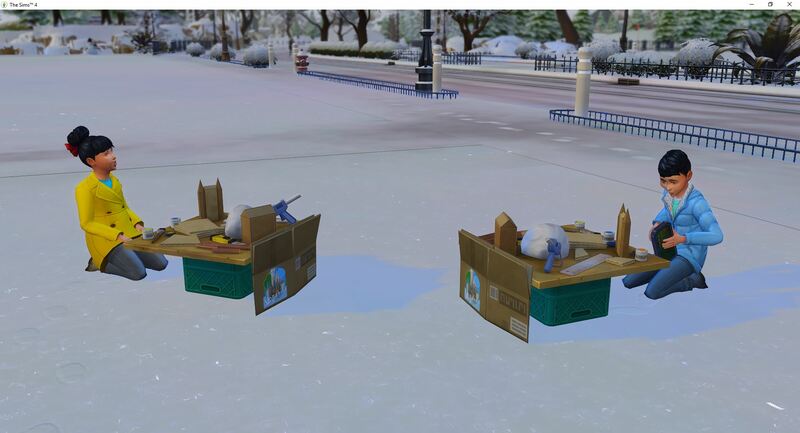 Jade left for work, leaving them outside. Now who should they watch? How about they watch each other for awhile – at least this way, no one will run away. Ngoc is still inside chained to the potty, sad because she peed on the floor, and because Darien and Jade left her behind. How could they possibly leave her behind? She is the cutest and sweetest and most adorable of them all? Although her feet are wet from the pee on the floor – doesn’t anyone care? 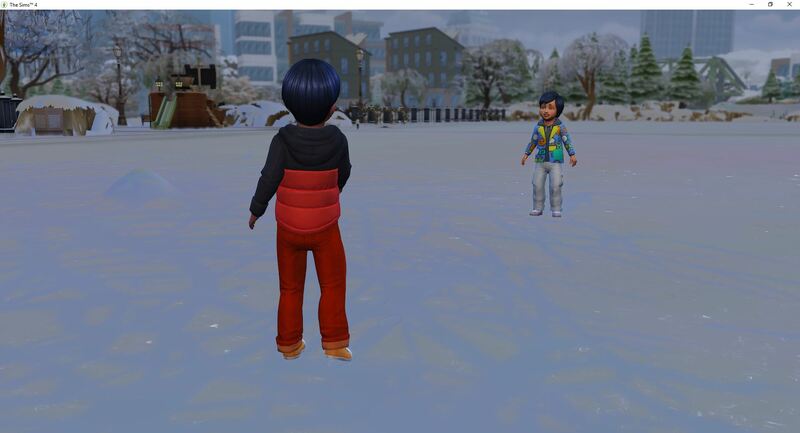 The boys realize it is easier to watch each other if they stand close to each other. Okay, that’s weird and boring. 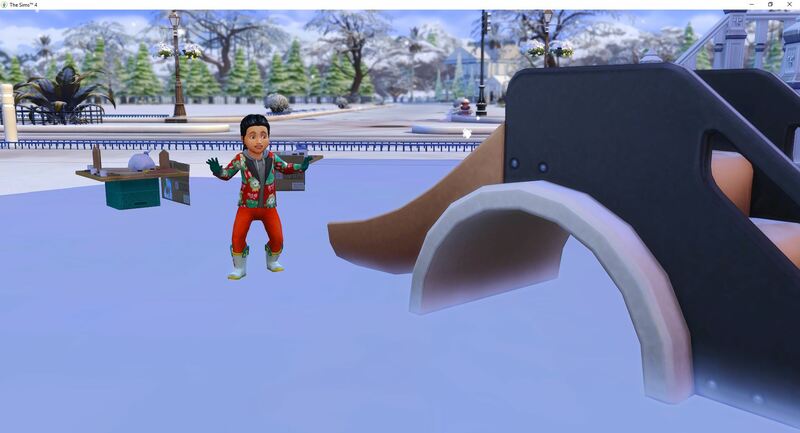 Then they realize there are blocks inside where it is warmer. And maybe not quite as boring. This is so much better, but not faster. However, they are both at level 4 so they are getting there. They can irritate their parents when they get home by asking questions this evening. 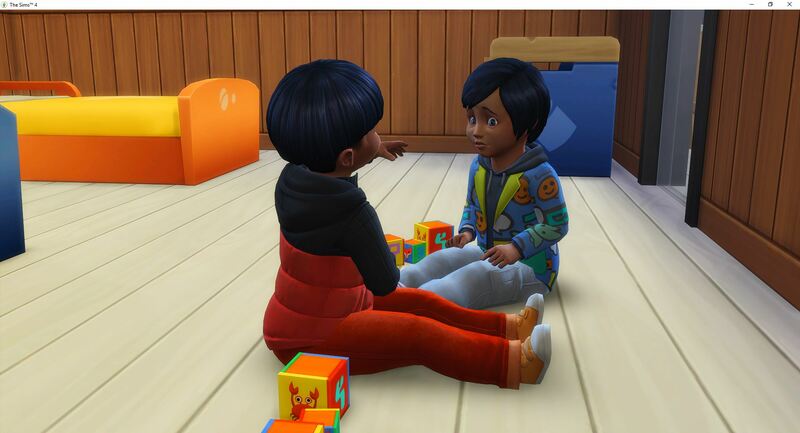 Maybe if they played with the blocks more and talked less the skill would improve faster. A novel idea, I know. Summer, GTFO out of their house, there is nothing to see here. Darien calls her over and she leaves on her own. Friday evening and they are just getting back to the projects for this week so no extra credit for getting them done quickly. Dusty already has an A and it is almost his birthday (2 days) so maybe he will get the boost for his high school grade. Alyxus is still rocking a B and needs the boost for her elementary school A. 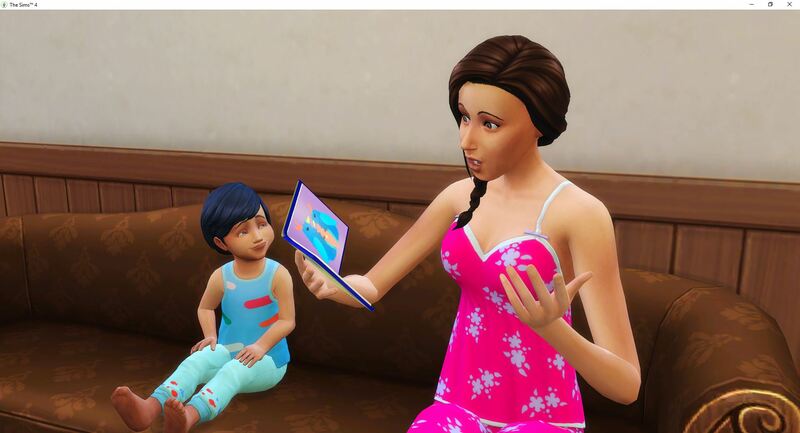 She still has 6 more days as a child so she will need it next week. 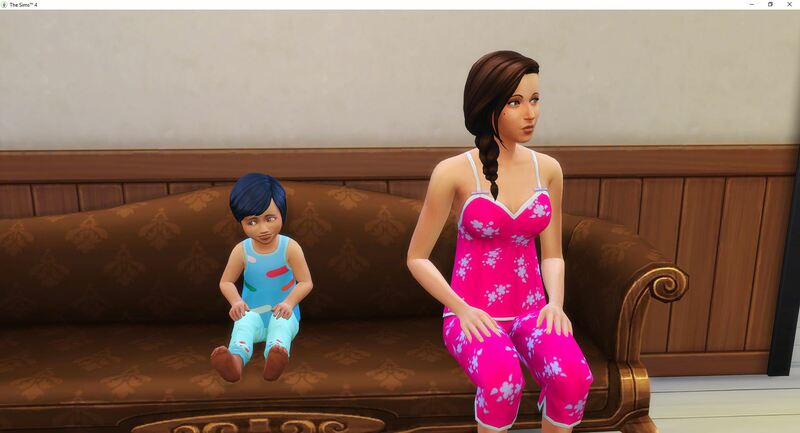 Ruthy has 9 days as a child and she isn’t even in the picture yet. 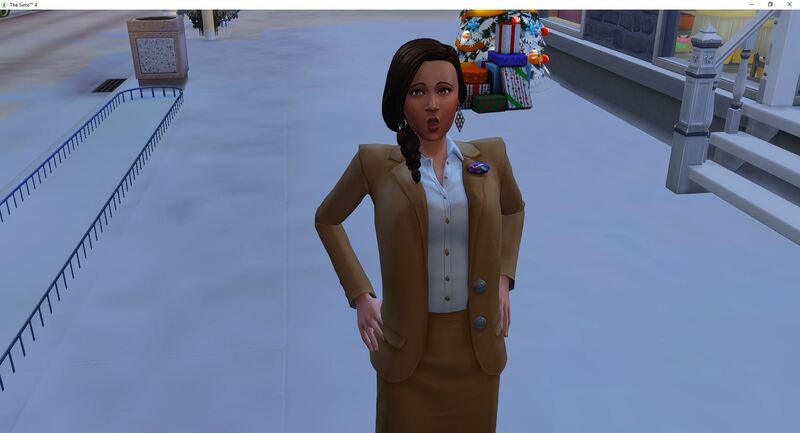 Jade brings home a promotion and for once, she doesn’t look like she rolled around in mud to get it. 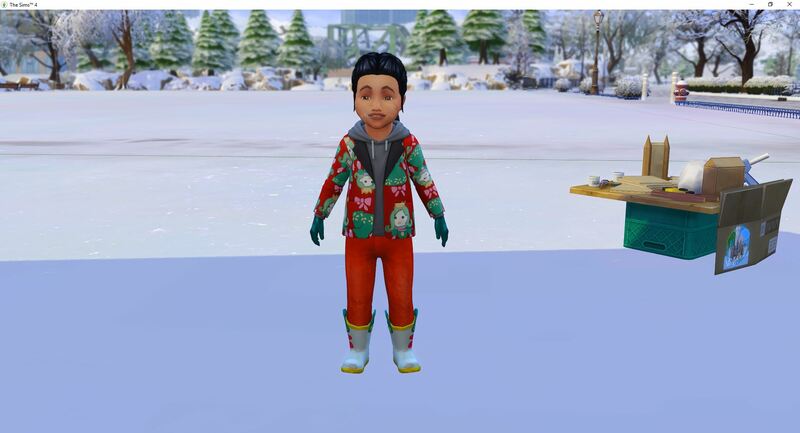 Fundraising Specialist, level 6 – and I just realized I never deleted the pile of presents – I totally forgot they were there. 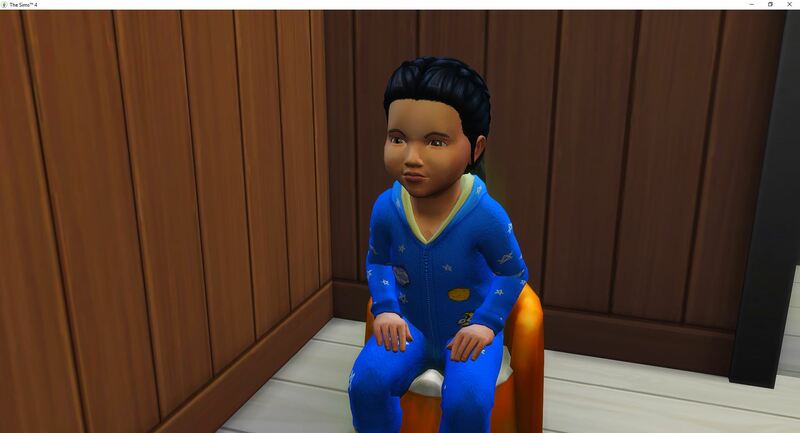 Yes, I totally made Ngoc get up and go to the potty to get the last little bit of skill she needed to master the potty for the points so that this update would end on a success, and with a picture of Ngoc. Now go back to bed.